Robert Kuderer has over 28 years as a litigator and has successfully tried dozens of cases to verdict. He has also successfully argued numerous cases in various state and federal appellate courts. Bob specializes in insurance defense litigation, surety bonds, professional liability licensure and defense, and insurance coverage. 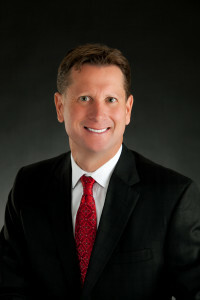 Mr. Kuderer heads the firm’s insurance coverage practice group. He has handled numerous high-profile large loss lawsuits both inside and outside Minnesota in both state and federal Courts. He successfully argued before the Minnesota Supreme Court the State’s seminal case establishing good faith immunity for officers and directors of non-profit corporations. He is a continuing education lecturer and has presented at professional and trade organization conferences. He has been perennially honored by his peers as a “Super Lawyer” in Minnesota Law & Politics, most recently in 2018. He enjoys an “AV” rating by Martindale-Hubbell. Mr. Kuderer is a past member of the Young Presidents’ Organization (YPO/WPO), an international organization devoted to developing business leaders through education and exchange. He is also a long-time volunteer for Eden Prairie Youth Athletics and past President of Olympic Hills Golf Club.